Our customers are our partners in the implementation of international freight services. We treat them with respect and professionalism, by offering them a package of benefits which distinguishes our freight forwarders network as a preferred network of logistics companies. The first thing we provide with our international freight forwarding for our customers is high quality of the services. The quality assurance is guaranteed by the professionalism of the personnel of the member companies in our network of freight forwarders. Each of the member companies of IFA can offer that qualified employees accompany various types of freights, in case of a need for a person with experience in the routes as well as with the specific requirements for safety compliance, including transport of dangerous goods. Your cargo will be packed in accordance, in order to stay safe from damage or loss during the forwarding. 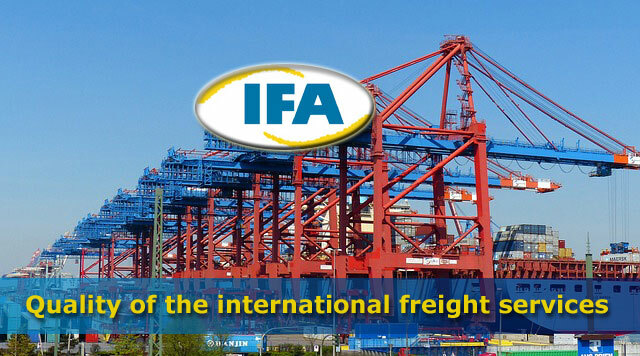 The member companies of IFA maintain constant control over all elements in the international freight services chain. This allows them to control any problem which occurs in any unit of the logistics chain in time due to the large number of ready solutions for all possible problems, such as delays, the need for changing routes and others we have. The modern commerce around the world cannot develop without international freight forwarding and storage of goods and cargo for stock maintenance in specific locations. The member companies of our freight forwarding association pay particular attention to the supply and improvement of their business logistics services. This allows our customers who are commercial companies to rely on regular deliveries and storage of goods and cargo to stores and clients. With our network of freight forwarders, the entire flow of raw materials to the ready products to stores is carried out smoothly. We adhere to the principles of the seven factors of compliance, which are essential for business logistics: ensuring the right products at the right time, with the appropriate quality, at the correct place, to the proper clients and at the right price.